Following her recent illness Monica has decided to remain in Sweden on a permanent basis. Therefore we’ve decided to end our personal and musical partnership with immediate effect. We would both like to take this opportunity to thank you all for your support over the last two and a half years. 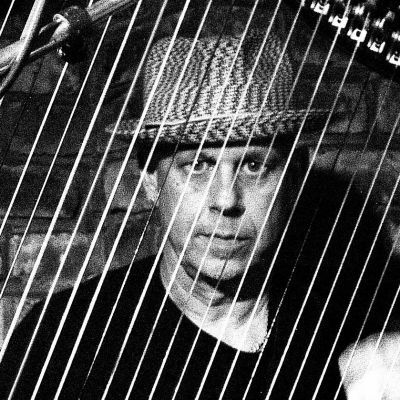 Ex-Subs bassist PAUL SLACK will be playing live with Allegra Shock on Sunday, 16th September at The Wheelbarrow in Camden, London. Paul has been invited to play onstage with the excellent ROMAN ELECTRIC BAND for possibly 3 of their forthcoming gigs in France 13th to 17th August inclusive. 25/07/2012: Get Well Soon Monica! 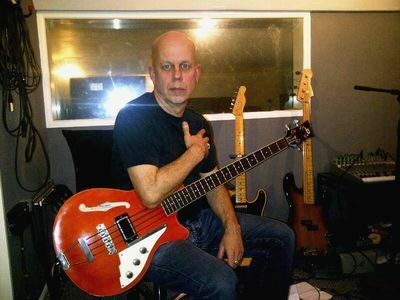 Time & Matter website regrets to report that ex-Subs bassist Paul Slack has had to "announce that Monica and the Explosion have cancelled all of their gigs for the foreseeable future. Monica is currently in Sweden receiving specialist treatment for an acute illness and will require a lengthy period of recuperation." The band were interviewed and broadcast on RadioReverb at 7pm on 12 July. Paul and Monica are back in the studio today to finish off the forthcoming album. 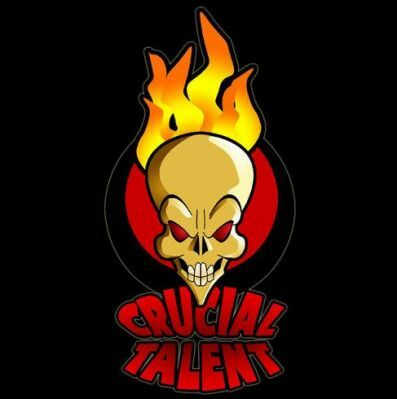 After this website was hacked and disabled for a time from 12/3/12 Paul decided to start publishing his Blog, previously hosted here since March 2010 to a new Blogsite. Monica and Paul will be in the studio from the 5th to 9th March recording a brand new album. The yet-to-be titled album will be Monica's third long-player. As with the last album, the recording will take place at Jigsaw Studios in Deeping St James, Peterborough. Monica enthused to T&M that everyone was "very excited with the plan to put down 11 tracks during the week", with there being "some very new ones as well as a number that the band have been playing live for some time." The new album will include such titles as 'I Wanna Go Home', 'Franglehead', 'Tonight! ', 'The Vulcano Song', and 'You Can't Take This Heart'. The production team will be the same as the 'Shut Up!' recording sessions, that of Monica, Paul, Rob Baylis, drummer with Dun 2 Def and engineer Tom Savage. 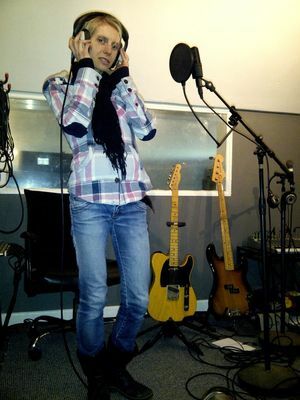 The new Monica and The Explosion album is due to be recorded in March 2012. More news soon folks! 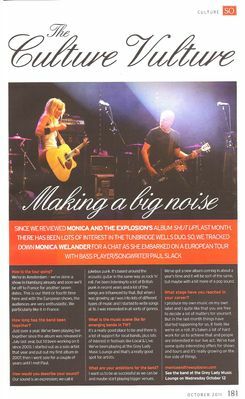 Monica and The Explosion have been interviewed in the magazine SO Tunbridge Wells. It has been published in the October issue, and you can read it by clicking on the image to the right of this news story. Cheers to Monica for the scan. 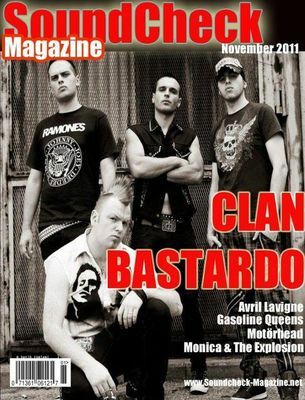 Monica and The Explosion are one of the interviews being published in the November 2011 issue of SoundCheck magazine. The cover is featured to the left, click the image to enlarge. 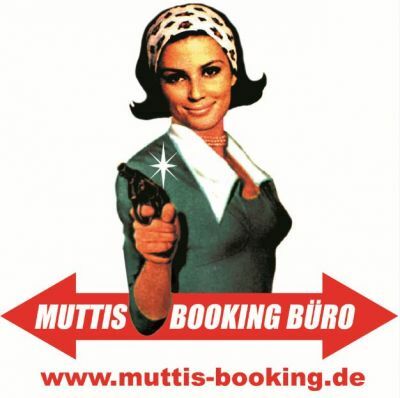 We will scan the feature for this website as soon as possible. 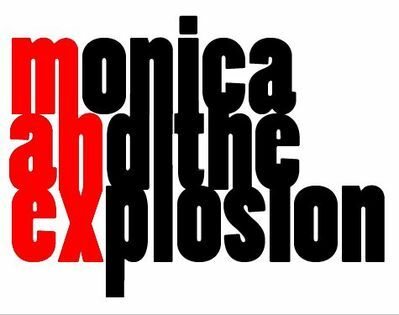 "Shut Up!- Monica and The Explosion. Female singers seem to be taking over the world right now, but if you want a break from the power ballads and quirky pop tracks, do not miss this feisty local musician. Strongly flavoured with classic British punk, Monica Welander - a Swede now based in Tunbridge Wells - is not so much a breath of fresh air, as a force-10 gale of honest, funny lyrics and insanely catchy tunes. She doesn't mince her words, with tracks like Intoxicated summing up Saturday night romance in blunt and witty style, while the opener Take it Or Leave Me has toes tapping from the very first bar. Any album that can put Culture Vulture in a good mood on Monday morning deserves the highest recommendation." 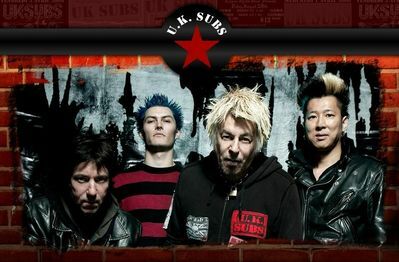 From the BBC Kent website: "Roger Day (DJ) Roger welcomes ex-UK Subs bassist Paul Slack for a chat and live session with his new band." Screen print from the website below, click to enlarge. Monica and the Explosion will be giving a live interview as well as performing an acoustic session for BBC Radio Kent next Tuesday 23rd August at 7:30pm. "Pelirocco platters with Monica and The Explosion"
The fourth major T&M interview has been published, this time with Paul Slack, with much input from Monica too... all from their February 2011 Australian tour. So after catching up with Monica and Paul recently in Ipswich I got myself a copy of the DVD single as after enjoying the last CD ‘Shut Up’ so much I wondered if a DVD would be as good…. 30/10/2010. The First thing you notice about this DVD is it has been Produced By Radar Proof Recordings who obviously know what they are doing as this is packaged and laid out very well. So that’s a good start as I have said before videos can either shine or be dire and this shines it adds to the song and makes it like your there with them, the sound quality considering this is Live is also Top class and crystal clear. Track 2 Friday Night also from the last Cd another typical Monica song upbeat and a joy to listen too with the added Singalong factor proven by the fact Paul (probably hasn’t sung since she’s Not There – UK Subs) joins in on Backing vocals, which again adds a nice little bonus to the song and boosts those sections, as to the video again different to the last one with a red haze over the main visuals and some great background images of people enjoying themselves again this boosts and enhances the song as a good video should so that’s two out of two now to the final track. Track 3 I want to Go Home a previously unreleased track which is a great bonus here its very bouncey and as catchy as you would want a song to be, as days later you find yourself just suddenly bursting into the hook line which can be quite embarrassing if you happen to be in Tesco doing ya shopping, also on this it really showcases Pauls wonderful walking bass style slick and Positive just like the man himself…if you have any doubt of that check out the Hat!!! Mr Cool. So to the visuals for this, again different to the previous two this is grainy with flickery lines running through it, I especially like the screen when it splits into 16 images and more and again the video enhances the song it doesn’t ruin or over power just makes it even more enjoyable. So there you go another HIT in the DVD camp and another great way to promote your band and music, Monica and The Explosion are a must see for 2011 if you haven’t seen them already and as I said if you haven’t seen the band with added Bass then it’s a whole different sound and one I for one am looking forward to hearing again soon. 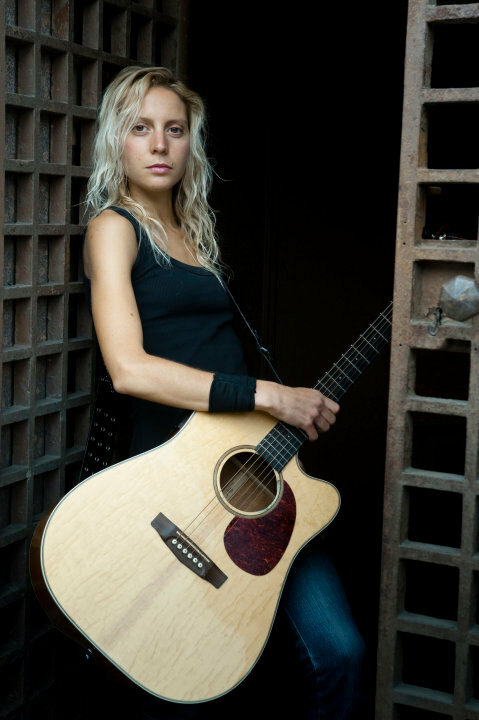 "Monica and the Explosion" or Monica Welander, which is her real name, is a punk rocking solo artist from Kalmar. Now she is living in England and releasing her second album “Shut up". And "Shut Up" is a refreshing energy explosion. Those who have followed Monica from the start five years ago can tell a lot has happened. 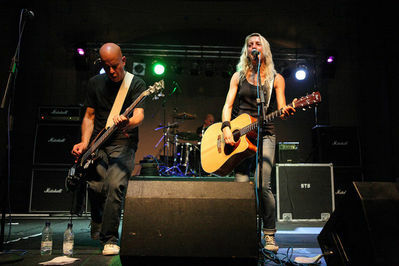 The debut album called "Monica and the Explosion" came in 2007, and in the very beginning Monica and the Explosion consisted of Monica and a vacuum cleaner. But now she has expanded with a backing band which works really well. 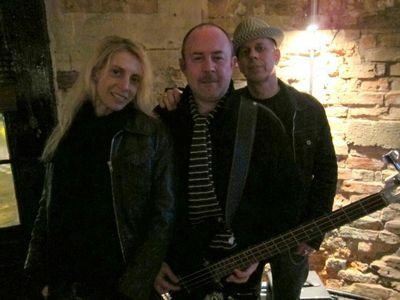 She is now joined by Paul Slack from UK Subs and Rob Baylis. And “Shut Up” is a record that makes your legs wanna move to use that expression, with a voice that is close to Patti Smith's and with sassy lyrics Monica Welander is a well needed energy injection in a sometimes too flat music scene. But it is not enough to just have attitude, to make a lasting impression you need something more and Monica and The Explosion has got that. She is a skilled guitarist and her lowest levels on “Shut Up” is very high. 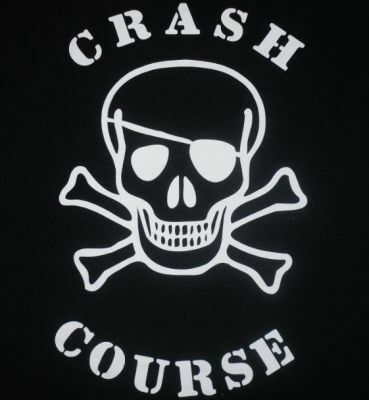 This is classic punk that belongs to the punk era before everything got commercialized and flat. To leave Sweden for London has no doubt helped Monica Welander. "Shut Up" feels a more thorough album and you can clearly hear British punk influences." Monica and the explosion eller Monica Welander som hon egentligen heter är en punkrockande soloartist från Kalmar. Just nu bor hon i London och släpper sitt andra album Shut up. Och Shut up är en uppfriskande energiexplosion. För den som har följt Monica sedan starten för fem år sedan har en hel del hänt. Debutplattan Monica and the explosion kom 2007, och i begynnelsen bestod Monica and the explosion mest av Monica och en dammsugare. Men nu har hon utökat med ett kompband vilket är välbehövligt. 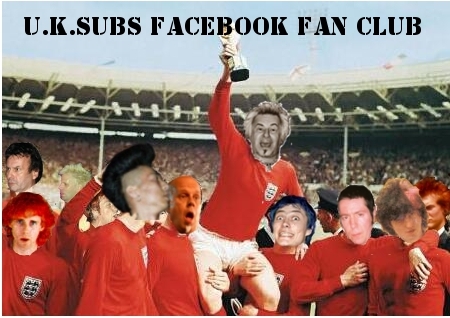 Med sig har hon Paul Slack från UK Subs och Rob Baylis. Och Shut up är en platta som får det att spritta i benen om man får uttrycka det så, med en röst som rör sig i närheten av Patti Smiths och med kaxiga låttexter är Monica Welander en välbehövlig energiinjektion i den ibland alldeles för tillrättalagda musikvärlden. Men det räcker inte bara med kaxig attityd, för att kunna göra ett bestående intryck måste man ha något mer att komma med och det har Monica and the explosion. Hon är en skicklig gitarrist och lägstanivån på Shut up är väldigt hög. Det här är klassisk punk som tillhör den där punktiden innan allt blev kommersialiserat och tillrättalagt. Att lämna Sverige för London har onekligen hjälp Monica Welander. Shut up känns mer genomarbetad och man kan höra tydliga engelska punkinfluenser. 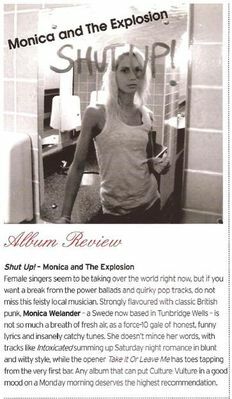 "Kalmar's one woman punk rock band Monica and The Explosion has released her second album entitled Shut Up! (Hands Up Music). 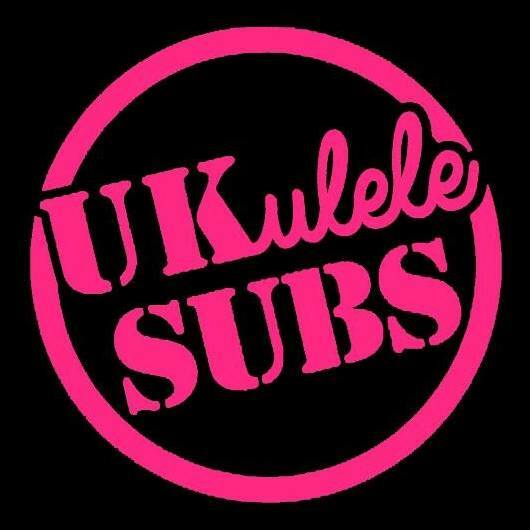 This time recorded in Peterborough with Paul Slack, who has been playing with both UK Subs and The Flying Padovanis. Monica is still moving on in her special style that she has been touring with - all around the world for the last couple of years. 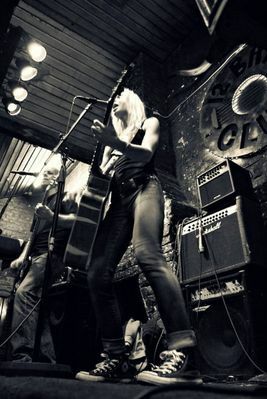 Acoustic guitar and punk coloured songs that sometimes boil over with energy and enthusiasm. 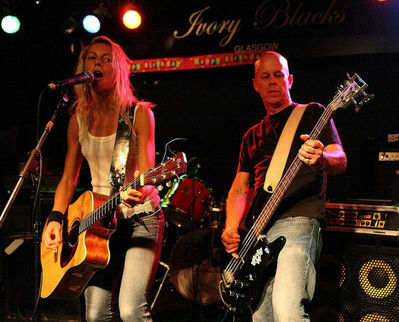 This type of music is really made to be enjoyed live but Monica manages well to catch the natural live feeling in the studio with attack and bite in both her guitar strumming and her singing, as well as the songs themselves. The "Best Song" is a song that really catches you, that kind of very successful song with a melody that has a pop feeling but put together in a punk attacking performance. The title track "Shut Up!" also stands out a bit extra just like "Go (I Gotta Go)" which is one of the most intense songs. And I really like "I Wanna Be Your Doll". There is a very special drive in the rhythm that makes it very delicate." tillsammans med Paul Slack som varit med i både UK Subs och Flying Padovanis. Monica kör på i sin speciella stil som hon turnerat runt världen med i några år. Akustisk gitarr och punkfärgade låtar som ibland nästan kokar över av energi och entusiasm. Egentligen är ju musikformen gjord för att avnjutas från livescener men Monica lyckas väl med att fånga den naturliga livekänslan i studion med attack och bett i såväl gitarrspelet som sången och själva låtarna. The Best Song är en låt som biter till rejält, en sån där väldigt lyckad låt av typ melodi med popkänsla förpackat i punkens attackerande spelsätt. Titellåten sticker också ut lite extra liksom Go (I Gotta Go) som är en av de mest intensiva låtarna. Och jag gillar verkligen I Wanna Be Your Doll. Där finns ett speciellt driv i rytmiken som gör den väldigt läcker. 03/10/2010 - STRAIGHT IN AT NUMBER ONE! The Monica and the Explosion INTERVIEW which included a LIVE performance of “I Wanna be Your Doll”, “More out of Life” from the Monica and the Explosion CD 'Shut Up' and another LIVE performance, this time of “Go I Gotta Go”. The “Shut Up” title track is then played to conclude. TOP STUFF! 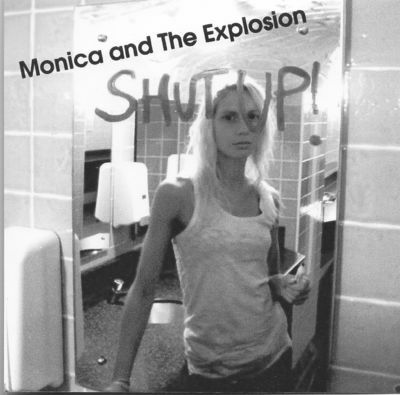 Monica and the Explosion – Shut Up! With the bassist of punk rock legends U.K. Subs? It may sound like a gimmick, but one listen to the album and any of those notions are soon dispelled. 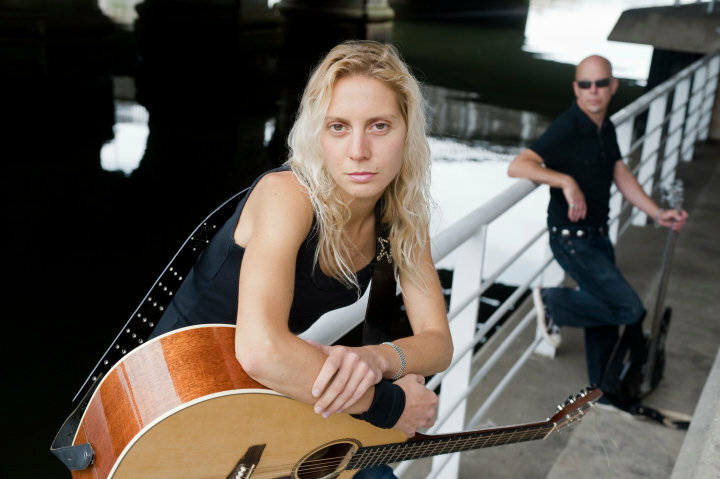 Monica Welander is the front-woman of this three-piece band, and she’s got enough sass to pull the album together. Songs like “Take It Or Leave Me” and “Shut Up” are fiery musings with a little bit of Joan Jett attitude thrown in. The album might be a little rough at the edges but that only adds to it’s charm. Let it explode out of your stereo and enjoy! 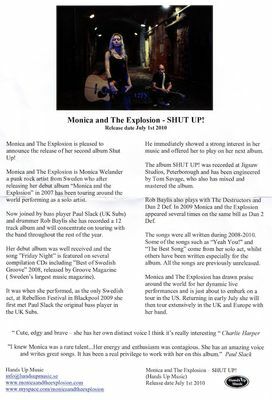 1 JULY 2010 - Monica and The Explosion: Shut Up! 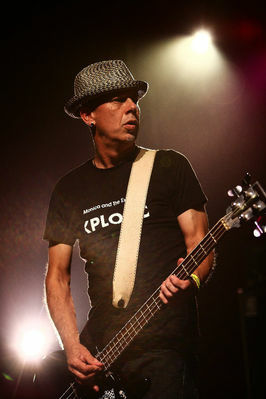 Paul Slack plays bass on the second album by Monica and The Explosion, called 'Shut Up! ', which is released today.